Things in our life that are blue: our nail polishes, our significant others’ eyes, and our favorite silk pajama shirt. Things in our life that are not blue (but should be): our skincare regimen. We love an exquisitely packaged product, but we’re used to a standard, neutral interior—our creams range from white to golden, with some black thrown in (love you, charcoal mask). Blue skincare, however, is about to take over, and there’s a whole slew of new products for proof. From ocean-blue face oils to soothing, buttery body balms, blue is the warmest—nay, hottest—color. Keep scrolling for two ingredients you need to know. 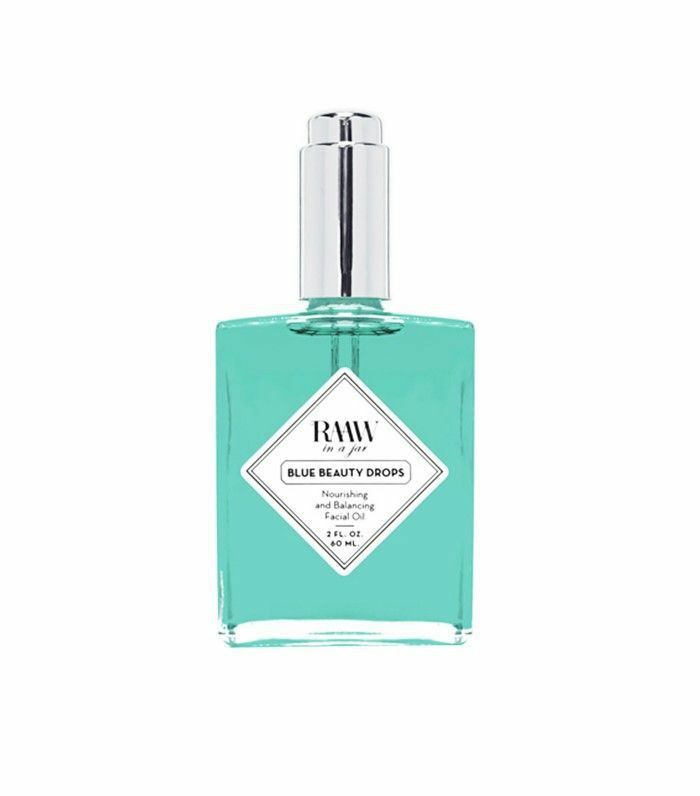 We recently tried and fell in love with Raaw in a Jar’s Blue Beauty Drops ($62), partly for the fact that it looks beautiful sitting on our bathroom counter, and partly because it balances our oily skin like none other (and smells like a dream, to boot). 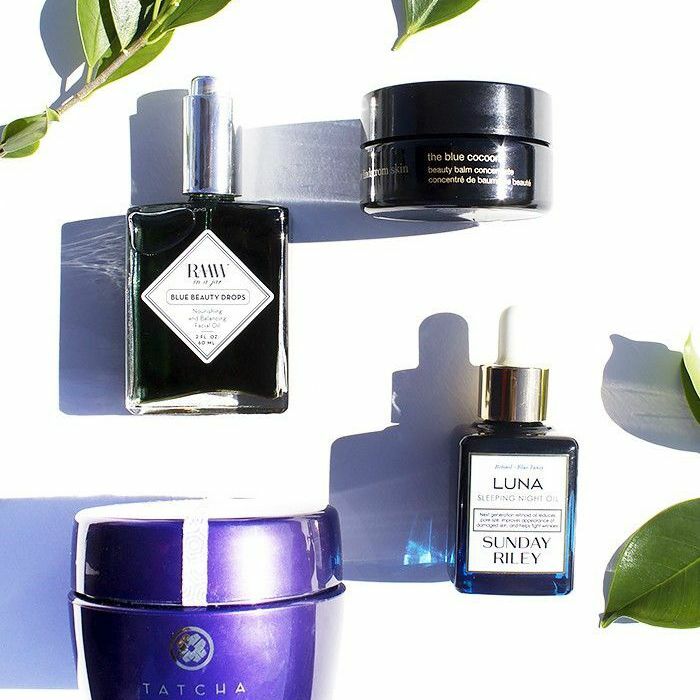 So what exactly is blue tansy, and why is it skincare’s new darling? According to the brand’s founder, Trice Christiansen, blue tansy is a plant that is useful for treating inflamed, irritated, and damaged skin—but also happens to be great when used in a face oil for oily and combination skin. “I tested Blue Beauty Drops on a lot of my friends, and they all got the same amazing results and a much healthier glow,” she tells us. May Lindstrom, founder of her eponymous line of luxe natural products, also touts the soothing skin benefits of blue tansy. As an eczema sufferer herself, she sought to create a product that would soothe her painful blisters. 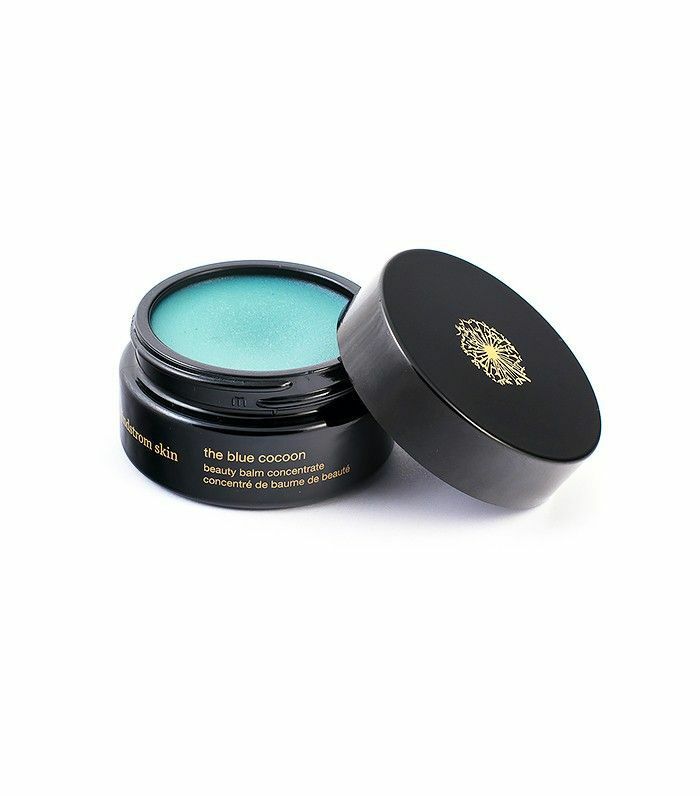 Enter her line’s cult Blue Cocoon ($160), an ultra-luxurious, blue-tinged balm that melts into a serum when massaged into the skin. “It’s essentially the most beautiful and transformative facial oil you’ve ever experienced,” she says. “It is a powerful anti-inflammatory and soothes skin in the most beautiful way, providing the perfect level of hydration and healing, eliminating redness and irritation.” Like Christiansen's Blue Beauty Drops, Lindstrom’s blue tansy–infused balm promises to work for all skin types but is especially effective in calming eczema, psoriasis, dermatitis, and rosacea. Another blue ingredient that soothes irritated skin? Indigo. 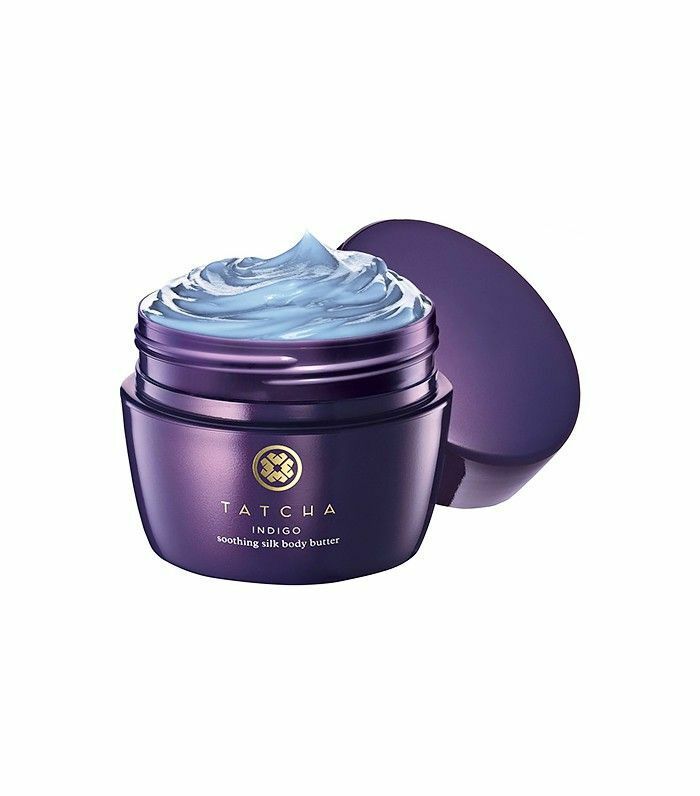 Vicky Tsai of Tatcha used it as the basis of her Indigo line, a collection of skincare products specifically targeted for those with sensitive skin. “We discovered that samurai used to dye their clothing with natural Japanese indigo to help heal their skin,” she tells us. “Our team met a farmer who had been growing indigo for generations and whose wife was able to use the botanical to treat his skin ailments.” The scientists at Tatcha tested it in a formula for Tsai’s own steroid-resistant eczema, and she says the formula was able to clear it up for the first time in years. The line’s Indigo Soothing Triple Recovery Cream ($135) received a seal from the National Association of Eczema and counts real women, mothers, and dermatologists alike as fans. 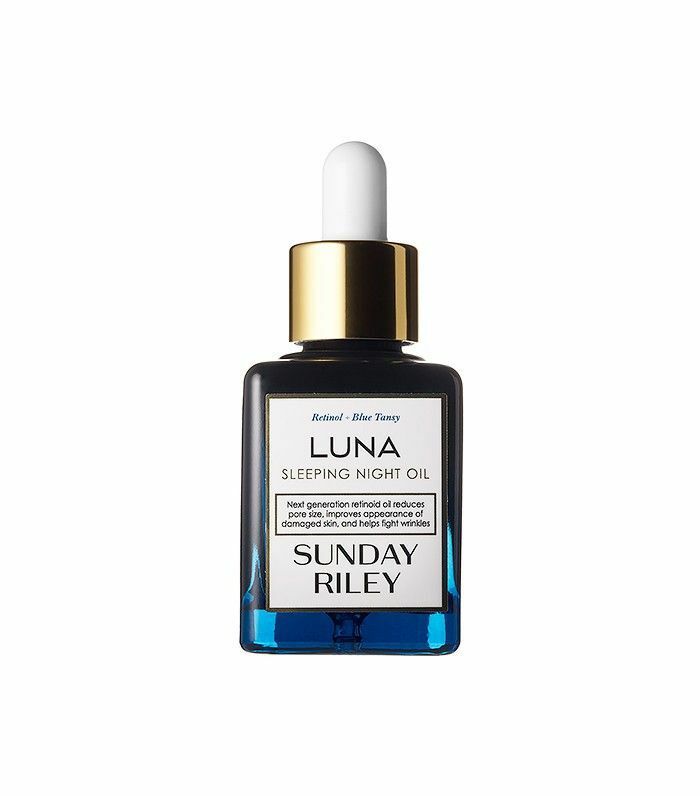 For those who suffer from dull, aging, and sensitive skin, we wholeheartedly recommend another blue skincare product: Sunday Riley’s Luna Sleeping Night Oil ($105). The retinoid oil does everything from reduce pore size to help fight wrinkles, while the blue tansy pure essential oil calms sensitive and inflamed skin. Another key ingredient in the formula is azulene, a naturally occurring substance that adds the blue pigment but recently has been found to have anti-inflammatory benefits, as well. Many skincare products for acne have azulene to counteract the redness from acne, but also for its ability to help breakouts clear up more quickly. Azulene can be derived from chamomile, which makes it incredibly soothing to the skin as well. So, the key takeaway is this: Blue-colored skincare products just might save your sensitive skin. Keep scrolling to shop some of our favorite blue skincare products! Have you tried any blue skincare products? Tell us below!